These ethereal, twisted ice sculptures litter the frozen shoreline of Tempelfjorden, Svalbard, giving the landscape an otherworldly feel and creating a contrast with the towering ice cliff of the glacier and the mountains behind. They are natural flotsam, the scoured remnants of icebergs calved from the Tunabreen glacier, washed up on the shoreline. These icebergs were calved from the Tunabreen glacier, which flows into Tempelfjorden from its source at the Lomonosovfonna ice cap. Tunabreen is a surge-type glacier, which means that it periodically switches between long periods of slow, stable flow to short-lived periods of very fast flow during which it advances. Tunabreen has historically surged approximately every 35 to 40 years, and its calving front advanced more than 2 kilometres during a surge in 2004. 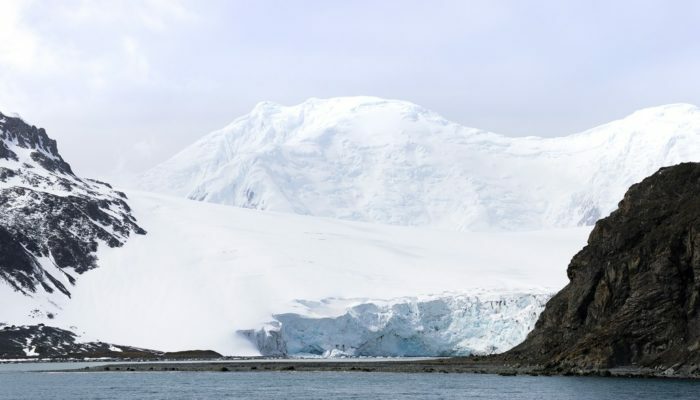 Tunabreen is one of the glaciers monitored by the Calving Rates and Impact on Sea Level (CRIOS) project, an international initiative that involves several institutions. The glacier tends to slow during the winter months when there is less meltwater available to lubricate the sliding of ice over bedrock. Glaciologists were caught by surprise, therefore, when in late 2016 the glacier was observed to accelerate to speeds in excess of 3 m/day from the more usual 0.4 m/day. This acceleration began at the glacier terminus and spread up to 7km upstream over the following months. Tunabreen appeared to be surging decades earlier than expected! The causes of this change in the glacier’s behaviour are not certain. However, the onset of this acceleration followed an unusually warm and wet autumn. Sea ice, which usually acts to oppose the flow by applying a resistive pressure against the calving front, also failed to form in Tempelfjorden over the winter. Both of these factors likely contributed. As a result of the flow acceleration, the surface of the glacier has become heavily crevassed, posing a hazard to travellers and glaciologists hoping to cross it! I was fortunate to be able to visit Tunabreen in March 2017, as part of a glaciology course taught at UNIS, the University Centre in Svalbard. The view of the glacier’s 100ft high calving front framed by the mountains in the background is spectacular, and the trip by snowmobile was a fantastic daytrip. The surge continued throughout 2017 and early 2018, with the calving front advancing by more than a kilometre during that period. Since the summer of 2018, flow velocities have been decreasing, so it appears that the surge may have come to an end. This episode illustrates that there is still much we have to learn about the dynamics of surge-type glaciers, and that they can still take us by surprise! 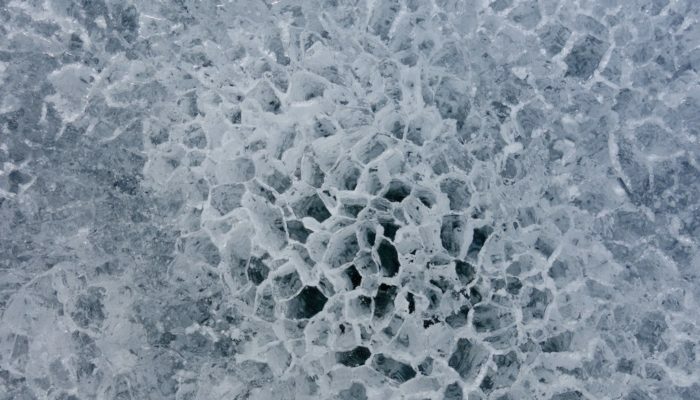 These delicate ice structures may look like frozen honeycombs from another world, but the crystalline patterns can be found 80 degrees south, in Antarctica, where they are shaped by the white continent’s windy conditions. In Western Antarctica is a 9-kilometre line of rocky ridges, called Patriot Hills. Often cold wind furiously descends from the hills across Horseshoe Valley glacier, sculpting doily-like designs into the surface layer. “The wind exploits weaknesses in the ice structure, picking out the boundaries between individual ice crystals, leading to the formation of a honeycomb pattern,” said Helen Millman, a PhD student at the University of New South Wales Climate Change Research Centre, who captured this photograph at Patriot Hills. Besides creating decorations out of Antarctica’s ice, the region’s intense winds, known as katabatic winds, also cause sublimation, in which the ice on the glacier’s surface turns directly into water vapour. This phenomenon creates a snow-free zone that experiences a net loss in frozen mass, also known as ablation; it also gives the ice a slightly blue hue and ”small, smooth waves that resemble the ocean in a light breeze, despite the intensity of the katabatic winds,” Millman added. “Since older ice rises as the surface layers are ablated, the ice at the surface of blue ice areas may be hundreds of thousands, or even millions of years old,” said Millman. This allows for some pretty interesting geological artifacts to reach the glacier’s surface, such as meteorites. “This conveyor belt of old ice rising to the surface means that high concentrations of meteorites can be found in blue ice areas.” Scientists can study these ancient Antarctic meteorites to learn more about the formation and evolution of our solar system. The Antarctic Search for Meteorites program for instance has collected more than 21,000 meteorites since 1976, and are on the hunt for more. 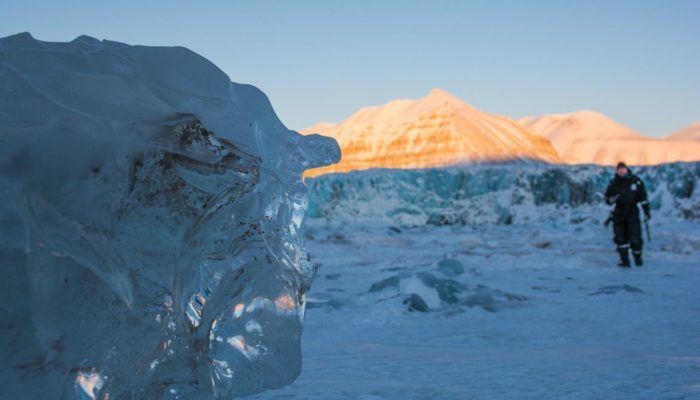 Where in the world can you find some of Earth’s oldest ice? That is the question a team of French and US scientists aimed to answer. They recently identified spots in East Antarctica that likely have the right conditions to harbor ice that formed 1.5 million years ago. Scientists hope that obtaining and analysing an undisturbed sample of ice this old will give them clues about Earth’s ancient climate. The team published their findings in The Cryosphere, an open access journal of the European Geosciences Union (EGU). When snow falls and covers an ice sheet, it forms a fluffy airy layer of frozen mass. Over time, this snowy layer is compacted into solid ice under the weight of new snowfall, trapping pockets of air, like amber trapping prehistoric insects. For today’s scientists, these air bubbles, some sealed off thousands to millions of years ago, are snapshots of what the Earth’s atmosphere looked like at the time these pockets were locked in ice. Researchers can tap into these bubbles to understand how the proportion of greenhouse gases in our atmosphere have changed throughout time. As of now, the oldest ice archive available to scientists only goes back 800,000 years, according to the authors of the study. While pretty ancient, this ice record missed out on some major climate events in Earth’s recent history. Scientists are particularly interested in studying the time between 1.2 million years ago and 900,000 years ago, a period scientifically referred to as the mid-Pleistocene transition. In the last few million years leading up to this transition, the Earth’s climate would experience a period of variation, from cold glacial periods to warmer periods, every 40,000 years. However, after the mid-Pleistocene transition, Earth’s climate cycle lengthened in time, with each period of variation occurring every 100,000 years. Currently, there isn’t a scientific consensus on the origin of this transition or what factors were involved. By examining old ice samples and studying the composition of the atmospheric gases present throughout this transition, scientist hope to paint a clearer picture of this influential time. 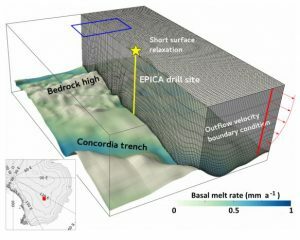 “Locating a future 1.5 [million-year]-old ice drill site was identified as one of the main goals of the ice-core community,” wrote the authors of the study. Finding ice older than 800,000 years is difficult since the Earth’s deepest, oldest ice are the most at risk of melting due to the planet’s internal heat. Places where an ice sheet’s layers are very thick have an even greater risk of melting. Mesh, bedrock dataset (Fretwell et al., 2013; Young et al., 2017) and basal melt rate (Passalacqua et al., 2017) used for the simulation. Credit: O. Passalacqua et al. 2018. “If the ice thickness is too high the old ice at the bottom is getting so warm by geothermal heating that it is melted away,” said Hubertus Fischer, a climate physics researcher from the University of Bern in Switzerland not involved in the study, in an earlier EGU press release. 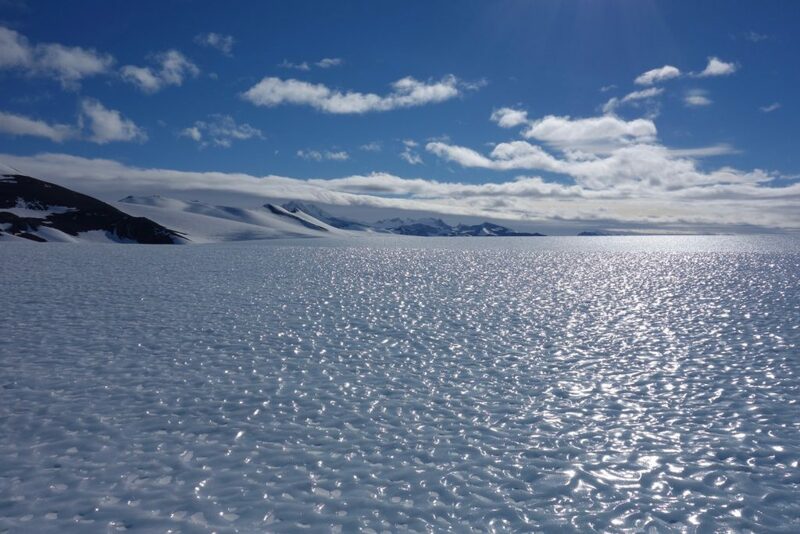 The authors of the recent The Cryosphere study used a series of criteria to guide their search for sites that likely could produce ice cores that are both old and undisturbed. They established that potential sites should of course contain ice as old as 1.5 million years, but also have a high enough resolution for scientists to study frequent changes in Earth’s climate. Additionally, the researchers established that sites should not be prone to folding or wrinkling, as these kinds of disturbances can interfere with the order of ice layers. Lastly, they noted that the bedrock on which the ice sheet sits should be higher than any nearby subglacial lakes, since the lake water could increase the risk of ice melt. Magenta boxes A, B and C correspond to areas that could be considered as our best oldest-ice targets. Colored points locate possible drill sites. Credit: O. Passalacqua et al. 2018. Using these criteria, the researchers evaluated one region of East Antarctica, the Dome C summit, which scientists in the past have considered a good candidate site for finding old ice. They ran three-dimensional ice flow simulations to locate parts of the region that are the most likely to contain ancient ice, based on their established parameters. 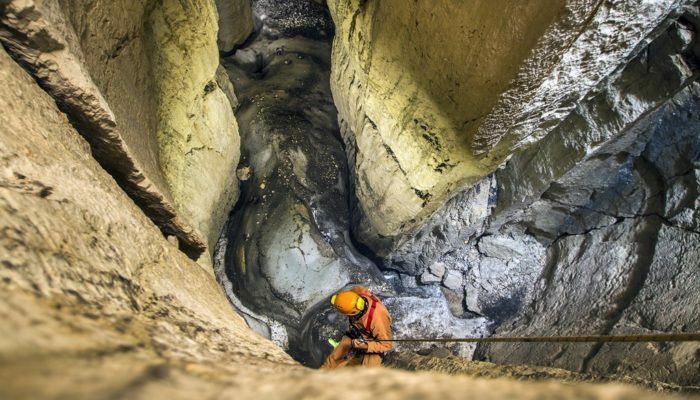 By narrowing down the list of eligible sites, the researchers were able to pinpoint regions just a few square kilometres in size where intact 1.5 million-year-old ice are very likely to be found, according to their models. 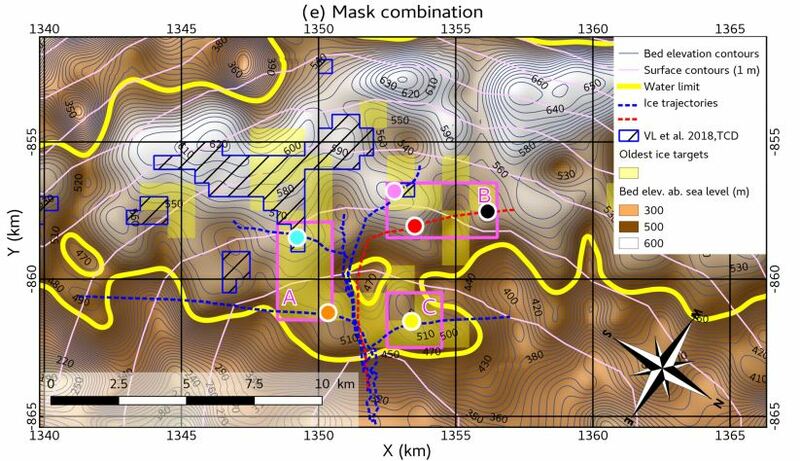 Their results revealed that some promising areas are situated a little less than 40 kilometres southwest of the Dome C summit. The researchers hope their new findings will bring scientists one step closer towards finding Earth’s ancient ice.